Now you can quickly and easily import offline contestants into your online sweepstakes and contests, combining the best of both worlds. That means you’ll be building momentum for your online sweepstakes and contests while reaching a new audience with street level marketing. Plus making those real life connections with your future clients will only strengthen any further digital communication boosting your online engagement. Automatic Notifications: Once you’ve uploaded your contestants into your contest, you have the option of sending them a confirmation email plus an invite to visit your contest site. This will improve their odds of winning by entering again via various online entry methods. Automatic winner picking: Let us do the work for you and avoid any possibility of bias by having our software choose and notify your winner at your specified time and date. Add Viral-share Entry: We create a custom tracking link that’s easily shared via email or social networks (Twitter, Facebook, Google+). The link your customers share is used to track any new contestants who enter the contest. Easy Prize Distribution: Avoid the cost and hassle of shipping with our new digital prize tool. That means you can give away tickets, software, videos, audio links, photos, gift cards and anything else that is uploadable. When should you add your offline entries? 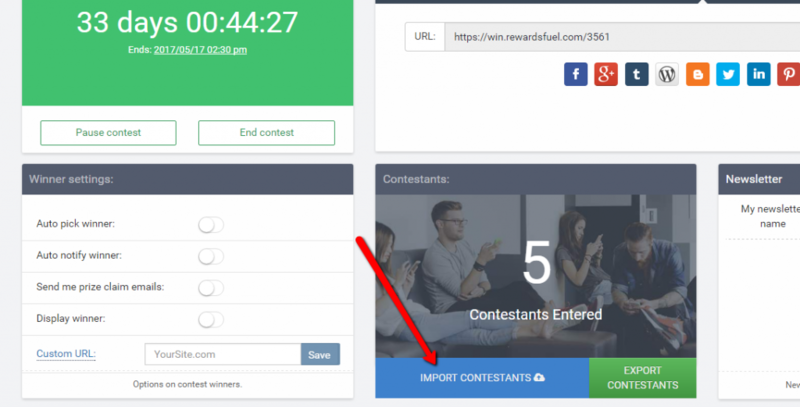 You can add your new contestants after you have created your contest and your contest is either live or ready to go live. If the contest is already live we will send out the notifications almost immediately. If the contest is ready but not yet live, we will send out the notifications when the contest starts. 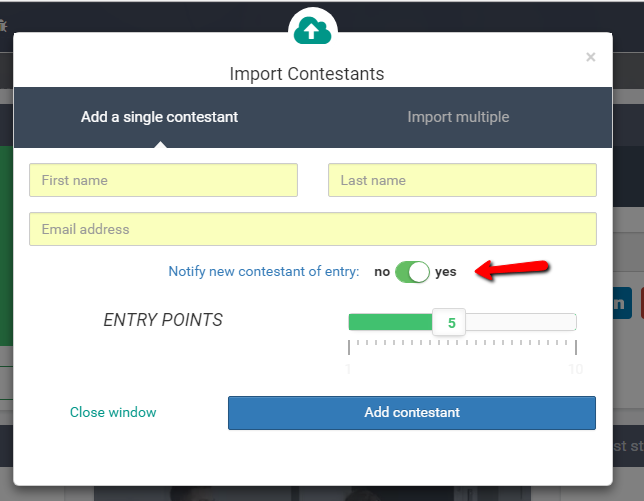 To add your contestants simply click on the import contestants button on the settings page of your contest. Next, choose to import your contestants one by one or by uploading a CSV of several customers at once. Questions, comments, or collaborations? We love to hear from you, send us an email to [email protected]. afterward i recommend him/her to pay a visit this web site, Keep up the nice work.